A decent digital camera should be part of your kit. It is recommended your camera be able to take pictures of at least 5 megapixels, the higher the megapixel the better the photo. This will allow you to zoom in and view finer details later on. Use the flash. Flash photography will illuminate some of those hidden areas where something may lurk. A digital camera can also double as a camcorder. Most have the ability to record video. Shooting video on your camera can rapidly drain your batteries and take up a lot of memory. Be sure you have packed extra batteries and your SD card has more than enough available memory. 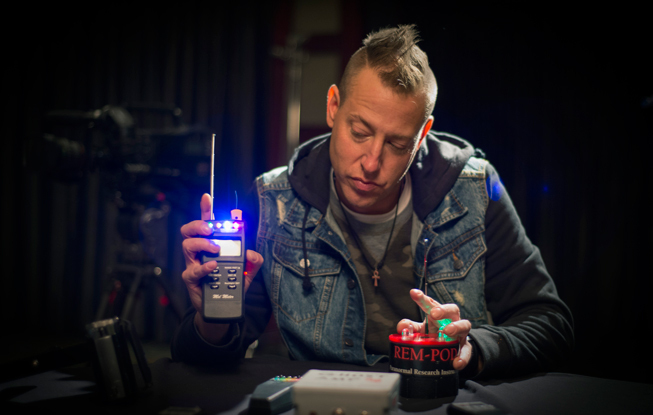 A digital audio recorder will be a benefit to you when you do any EVP (electronic voice phenomena) work. Audio recorders may even capture spirit activity if you leave it running when you investigate another area. Choose one that has a decent amount of memory, long battery life, and interfaces well with your computer. Using an external microphone, if it has the capability, will help eliminate any mechanical noise contamination by allowing you to place it away from the recorder during the session. Motion detectors can be used to alert you to movement when you are away from an area. A good idea is to have a video recorder watching the sensor(s) to ensure that nothing natural triggers it and you can verify an alarm if it’s something unnatural. This is particularly helpful if your detector only turns on a light when activated. Set up a few detectors around the location, in doorways, areas where there is known activity, and even a few on the stairs if the spirit you are looking for is known to use them. Try and find one that gives you the option of chimes or an alarm. Chimes are less upsetting and only announce the movement where the alarm blares and lasts longer. If you suddenly find yourself in a spot where you suspect there is spirit activity happening, your smartphone can be your saving grace. Most of the new smartphones already have the ability to take pictures. They are also capable of taking video. If you want to do some EVP they usually feature a voice recorder. The quality will not be the same as digital cameras or camcorders but, if there’s suddenly activity, you have a ready ghost kit at your fingertips. It is also your safety line if you need help.